1. Let’s start off with the new entrant to the Ithaca development scene – Trinitas Ventures. The Indiana-based firm is scouting out Varna for a potentially large rental project geared towards students (but, to be clear, open to anyone). I’ve already filed my report, and unfortunately will not be at the open house this Monday (there was initial confusion over what say it was, so I’m honestly not sure any reporter made it). Trinitas appears to do everything from multi-story mixed-use urban living to more suburban duplexes and townhouse strings. To be frank, for Varna, they’d be better off going with the latter for size and scale. There’s this running joke among Ithaca developers that Varna is the next frontier for development, but only recently has there been much movement in that direction, and even then, it’s a ‘tread with caution’ approach. Recall the struggles of Varna II and 902 Dryden. According to the town of Dryden planning board minutes posted after my article, the Lucentes’ vacant Varna II lands are the proposed site for Trinitas project (and which they likely already have a purchasing option on). From their portfolio, their independently-developed project appear to be in the ballpark of 600-700 beds in 150-300 units. 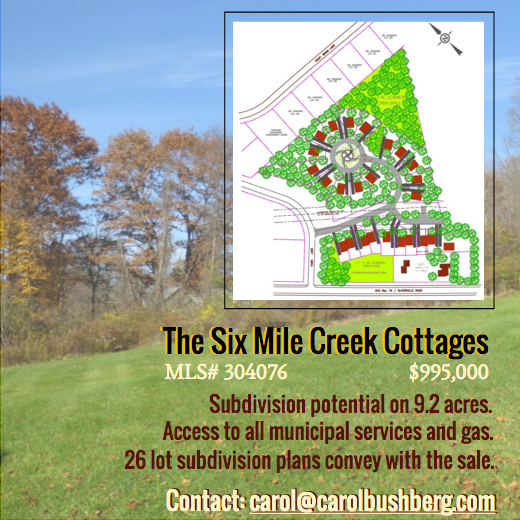 Even the more suburban properties look to be on 20 acres or less. A rough estimate of the old Varna II plan is 15+ acres. Most of it is Varna Hamlet Residential, with small amounts of Varna Hamlet Traditional Zoning and Varna Hamlet Mixed-Use. VHRD is 6 duplexes, 4 apartments or 11 townhouses per acre, with potential density bonuses for green energy or redevelopment. This means that if they do mixed-use retail/apartments along 366, and townhouses in the rear along Mount Pleasant Road, they’ve got the space they need for one of their projects. Through the off-record chatter I’m hearing 225 units, mid-600s for total number of beds. On the bright side, at least they’re being transparent with the open house approach – Trinitas seems to have some awareness of community concerns (maybe after their Ann Arbor debacle), so we’ll see what they propose in a formal submission. 2. Moving to something smaller, the Ithaca Landmarks Preservation Commission is providing early guidance for a new apartment house at 204 Williams Street, on the west edge of Collegetown in the East Hill Historic District. Beyond the massing concepts (hipped vs gambrel roof), it looks like 14 bedrooms and perhaps four units, ostensibly geared towards students. Mid-sized Collegetown landlord Pam Johnston has owned the property since 2002, and she’s more of renovator than a developer, but this is unique – the original house burnt down in the 2000s, and the space has been an informal parking lot ever since. With rising land values, redevelopment looks like a better financial prospect. Historic design specialist Jason K. Demarest is in charge of design for the small infill project. 3. Caution light turned on. The Tompkins Center for History and Culture requested and received an extra $445,100 in appropriations, raising the county’s investment to $3,345,100. The extra cost is attributed to bids coming in over projections and additional design costs. The vote was 12-1 with Legislator Leslyn McBean-Clairborne voting no, but this is probably about as much as the county legislature and general public will be willing to accede without significant backlash or denial of funds. The Legislature unanimously awarded construction contracts for the Tompkins Center improvement project to Marchuska Brothers Construction, LLC, of Endicott, for the General Work Contract ($561,000); Johnson Controls, Inc., of Rochester, for the Mechanical Contract ($502,638); and Richardson Brothers Electrical Contractors, Inc., of Ithaca, for the Electrical Contract $135,550). Marchuska is a fairly recent addition to the Ithaca area, and is finishing up a gut renovation of a manufacturing facility into medical offices in Lansing village. 4. Whether or not one approaches this with some election year political cynicism, the proposed $22 million expansion of the airport, largely funded by the state;s recently-announced $14.25 million grant, has significant potential to bolster the local economy. Given Ithaca’s relative isolation and definite distate for new highways, an expanded airport, sometime pushed by airlines rather than quixotic bureaucratic dreams, can help retain existing business and grow the leisure/hospitality trade. The announced move of the NYS DOT from its prime waterfront property to a vacant parcel next to the airport is an added bonus, because once they move, the space will be turned over to the county to do as it wishes – which in this case means an RFP for mixed-use development that could create over $40 million in new private investment, according to the 2015 study. Plans call for the expansion to start construction this fall and open a year later, which sounds a bit ambitious. 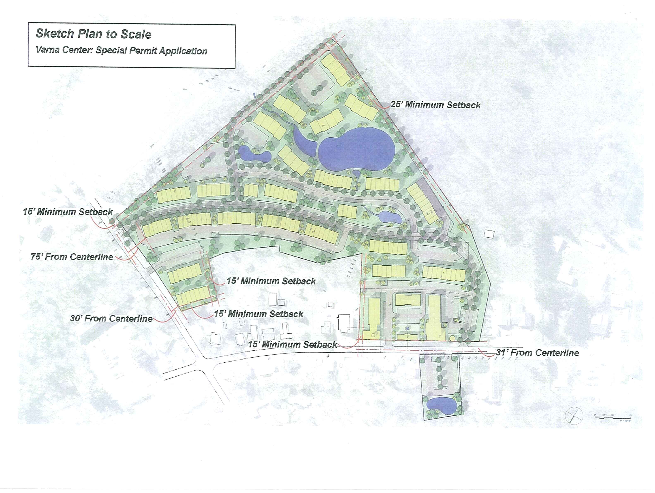 The expansion would likely have its environmental review conducted by the village of Lansing, which is not known for its haste or ease of process. Renders of the project (all interior) can be found here. CAP rate, or capitalization rate, is a measure to evaluate the potential return on investor for a real estate developer. It’s basically Net Operating Income / Property Asset Value. So if I make 50,000 a year in net operating income on a $1 million property, my cap rate is 5%. In general terms, higher cap rates mean high potential return, but are generally seen as indices of higher risk projects as well. I hadn’t heard of any issues before this hit the market, and all the approvals are there. The town of Dryden was told not to expect construction to start on this 36-unit property for at least a year. Whether it actually happens is anyone’s guess. 6. Also new to the market this week, a commercial building with redevelopment potential. 622 Cascadilla Street is a one-story, 4.896 SF commercial building occupied by the upscale Zaza’s Cucina restaurant. It also sits in WEDZ-1b zoning, West End Mixed-Use, allowing for a second floor and 90% lot coverage.Nearby, several major projects are approved or in the concept stages, including West End Heights, City Harbor, and the Carpenter Business Park (Cayuga Med) development. The property is assessed at $875,000, and its current owner, a Massachusetts-based businessman who has been controversial, has been steadily offloading his properties. Should the buyer look like something or someone interesting, expect a follow-up. 7. This is running rather late, but longtime local developer Rocco Lucente passed away earlier this year at the age of 88. The patriarch of the Lucente family of developers (Lucente Homes, later Lifestyle Properties), Lucente started in 1950 as a builder of modest homes and apartments – not ostentatious, but well-suited for Ithaca’s growing middle-class. While it may not have been as profitable per unit, it allowed Lucente to survive the local market crash of the late 1960s, when many of his competitors did not. Lucente also pioneered the idea of renting his newest houses out for a few years before selling them at higher prices thanks to tight supply and value appreciation. With over 700 homes and apartments to his name, much of Cayuga Heights and Northeast Ithaca exists because of Lucente Homes – the town dedicated a section of Briarwood Drive “Rocco Lucente Way” in 2014. Lucente was not without his controversies, however – the last of his Northeast Ithaca subdivisions, the 47-lot Briarwood II, which was halted by the town over stormwater drainage concerns in the late 2000s, first via moratorium in 2006-07, and then in 2014 by SEQRA concerns and changes to best practices, which led to a lawsuit from Lucente that he lost. This is the forested space between Sapsucker Woods Road and Briarwood Drive. I had a chance to speak with Rocco a couple of times in my work with the Voice (it started with the Village Solars), and I always found him to be engaged and animated, more than I’d expect for a gentleman of his age. He’d often extol the features of his properties, which I would respond with a polite laugh, because it wasn’t my place to sell them, but he was a businessman through and through. But generally, I found talking with him to be a pleasure. Rocco was a capable developer, working up until the end not out of need but for a love of the work. He will be missed.